Want to be home from home in a spacious luxury villa? Hectic day at the theme parks? Just feel like lazing around your own pool for the day? Then look no further, our villa is just what you need for perfect relaxation and home from home comfort. Situated in a quiet well-established residential area our villa will easily accommodate 2 families. This beautiful single storey villa overlooks a lake, thus affording perfect privacy whilst relaxing in the pool and Jacuzzi spa... As soon as you open the door, you are greeted with a large open foyer with a soaring vaulted ceiling. There is a large swimming pool with hot tub and decking area with sunloungers for lazing in the sun when you are taking a break from the parks. 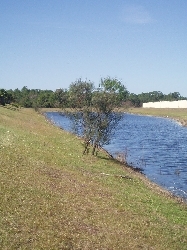 The pool backs on to conservation land with the view of a lake so is totally private. 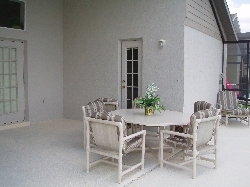 There is a covered lanai area with large table and chairs for alfresco meals. The doors from the house leading the the pool/patio area have child alarms on. 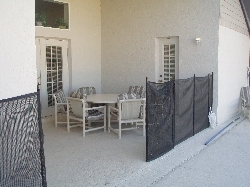 Safety fencing between patio and pool. 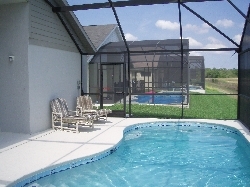 Pool heating (optional) is available although not normally required during the summer months. 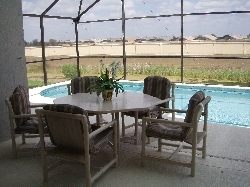 The pool is fully screened to keep the insects out but the lets sun in. In the large double garage there is a pool table, air hockey, table tennis and dartboard. 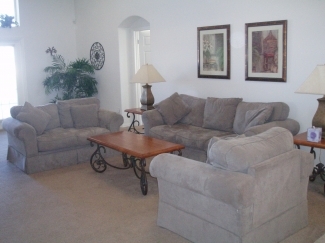 There is a large lounge with ample comfy seating, cable tv (100 plus channels) & DVD. A separate dining area for entertaining and a fully equipped kitchen with fridge/freezer, dishwasher, coffee maker, toaster really everything a good kitchen needs. There is also seating in breakfast area. Separate laundry room with washing machine, tumble dryer, iron, ironing board and hoover. 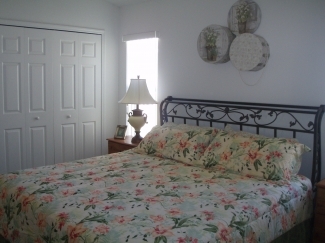 The master suite has a king size bed, telephone and cable tv. The master bathroom with large shower cubicle, sunken oval bath tub, twin wash basins/vanity unit, hairdryer, wc and walkin wardrobe with security safe. Door leading to pool area. There is a further bedroom with king size bed, cable tv and walkin closet. The en-suite bathroom has bath tub with over head shower, wc, wash basin/vanity unit, hairdryer. Door leading to pool area. Further bedroom with full double bed, cable tv and walkin closet. Next door bathroom has bath tub with over head shower, wc and wash basin/vanity unit. 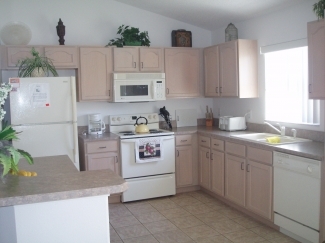 There are two twin bedded rooms both with cable tv and walkin closets. Between both bedrooms is a further bathroom with bath tub and over head shower, wc and wash basin/vanity unit. There are two telephones one in the kitchen and one in the master bedroom with free high speed internet access and free local calls. All towels (inc pool towels) and linen is provided. This is strictly a no smoking home. Our home has a monitored alarm system. You will also benefit from the knowledge that there is a Management Company on call 24 hrs a day should you have any concerns whilst in the villa. Whilst staying in the villa you are able to use the facilities that Indian Creek has to offer which are especially good for the children. 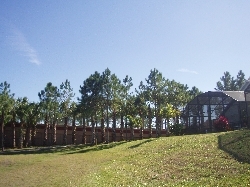 There is a tennis court, basketball court, football field, baseball net, playground and a jogging circuit around the lake. 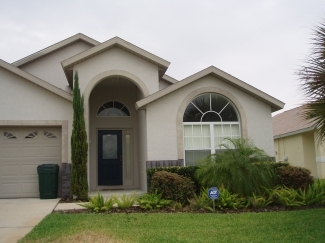 Orlando International airport is approximately 20 minutes away. Sanford Internation airport is approximately 50 minutes away. A car is essential to enjoy all attractions in the area at your leisure. We do accept shorter stays. Please contact the owner for price. We are very flexible and try to accommodate all requests. Please note that if your stay is for 6 nights or less than an additional sum of �65.00 is payable for cleaning.